• Something for the new year •Peter Brears has a long acquaintance with jellies in every guise. He was fed them in childhood, he turned to curating their moulds and associated artefacts while director of York and Leeds museums, he has made them for innumerable historical food shows and events.And jelly is a much bigger thing than some packet from the supermarket mixed with boiling water. In the first place, it was not factory-made gelatine that did the setting, but any number of ingenious adaptations of kitchen materials and ingredients. In the second, it was not just a simple clear, coloured solid, but an optical prism to show off and transform the foods contained within it. It was the cook’s greatest resource for introducing colour, variety and delight into the table display.The book sketches in the history of jellies, particularly in England, and discusses their place within a meal; gives several recipes based on the various setting agents (carrageen, gelatine, isinglass) and also for cereal moulds (flummery, tapioca, semolina, rice, cornflour, etc. ); describes how jellies may be assembled by layering, embedding, lining and inclusion of fruit, nuts, gold, etc. 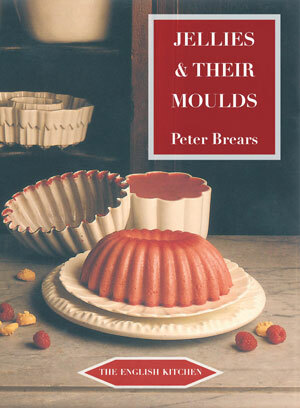 ; and gives an excellent illustrated account of the various forms of jelly moulds. Peter Brears is one of Britain’s foremost reconstructionist cooks and an adviser on historical food and its presentation. He was formerly Director of Leeds City Museums, having before that been in charge of the York Museum. His Cooking and Dining in Medieval England (Prospect) won the André Simon Award for Food Book of the Year for 2009. A PDF of the introductory matter, the bibliography and index and selected pages from the text of Jellies & their Moulds. The festive season is nearly upon us, and so I am prompted to write about festive things in the main for the next couple of weeks before the big day itself…and things don’t get much more festive than jellies, those stalwarts of many a children’s party. Even wunderkind chef, Heston Blumenthal used one in his Victorian Feast last year- this is a slightly -ahem-”adult” video, so do be warned…And as I haven’t written a book review or about food in the past few weeks I thought I would combine the two now in a review of a newly published book, Jellies and their Moulds by the renowned food historian, Peter Brears. We are justified in writing about them, therefore. The author heaves a sigh of relief. Jellies are unique in their range of physical properties. Although they are virtually tasteless, they can instantly absorb any chosen flavour drawn from fruits and spices, as well as readily dissolving sugars, wines and spirits throughout their mass. Having no texture of their own, they can take on those of creams, cereals, fruit purees, ground nuts and many other things or they can be whipped into foams. They can also be used to embed fresh, preserved or candied fruits or still custards and other jellies of contrasting flavour and colour. Being colourless at the outset they immediately take on the widest variety of tones, tinctures and degrees of opacity as imparted by all manner of edible liquids and colourings. They have no shape of their own but take on the shape of any mould or vessel into which they are poured. This list of attributes is already impressive but has yet to include their most important and unique characteristics. The first of these is perfect transparency, the second is dynamic movement, the wobble factor always a delight to the eye. The third …is their capacity to slowly release their flavours and textures into the mouth, prolonging the pleasure and appreciation of ingredients which otherwise would be more rapidly swallowed. This book, which covers the history of jellies from medieval era to the 20th century is part of Prospect Books’ superb English Kitchen series of books. Go here to see a wonderful 12 Days of Christmas Page of some of the books in the series, which are on offer . These are all reasonably priced, scholarly, interesting and readable books and Peter Brears’ book on jellies, the latest in the series, is no exception. I had the extreme pleasure of hearing Mr Brears’ talk on the subject of the Georgian Kitchen and the Domestic Offices in a grand Georgian House at the Costume Society’s symposium on Life in a Georgian Town which was held in Bath in 2005. He is a superb communicator, and has a wonderful grasp of all the intricate detail of his subject. If you ever get the chance to hear him talk, my advice is to go. Just go. The book is not solely concerned with our era, but the chapter on Georgian Jellies is 34 pages long and gives in great detail a plethora of recipes from the era for such wonderful and now sadly forgotten confections such as playing card jellies, a nest of eggs jelly, moon and stars in jelly and Oranges en Rubansor Jellies a la Bellevue. These are, in fact, small clementines or tangerine skins filled alternately with red wine jelly and white flummery. This is a superb little book, an ideal and inexpensive stocking filler for anyone interested in the foods of the past, and especially for anyone interested in the very different and accomplished jellies of the Gregorian era. It is written in Mr Brears’ usual lucid, knowledgeable and enjoyable style. It is illustrated profusely and with brio. It is a gem. Buy it.